The dinosaur-busting asteroid that slammed into Earth some 65 million years ago has been traced back to a collision between two monster chunks of rock 160 million years ago, out in the main asteroid belt. According to researchers at the Southwest research Institute (SwRI) and the University of Prague, the dino-killer most likely began its journey to Earth before T-Rex had even evolved, when a relatively small (60 kilometres) asteroid crashed into a much bigger 170 kilometre monster rock. The team says this impact produced what is now known as the Baptistina asteroid family, a cluster of asteroid fragments with similar orbits. There were originally 300 bodies larger than 10 kilometres, and 140,000 chunks larger than a kilometre. 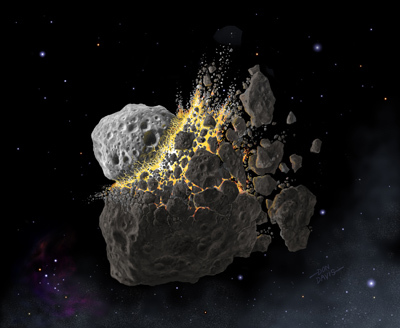 Over time, the asteroids drifted out of the main asteroid belt, spurred on by thermal variations produced when they absorbed sunlight and re-radiated the energy away as heat. "By carefully modelling these effects and the distance travelled by different-sized fragments from the location of the original collision, we determined that the Baptistina break up took place 160 million years ago, give or take 20 million years," Dr. William Bottke, co-author of the research explains. Eventually, about 20 per cent of the original family made their escape from the asteroid belt, and headed towards the Earth/moon system. Of these, some two per cent actually landed on Earth, fewer still hit the moon. The team says the family is likely to have spawned the rock that created the moon's distinctive Tycho impact, and the monster rock that created the 180-kilometre Chicxulub crater off the coast of the Yucatan 65 million years ago. Fellow researcher Dr. David Nesvorny elaborated: "The Baptistina bombardment produced a prolonged surge in the impact flux that peaked roughly 100 million years ago. This matches up pretty well with what is known about the impact record."